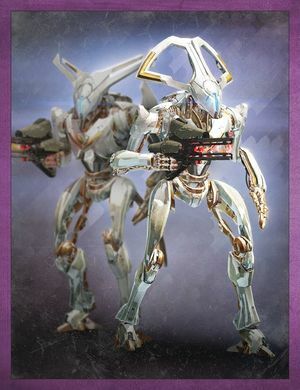 The Precursors (or Sol Primeval), are a Vex collective spanning from the distant past of the Vex network, reported to have been first encountered in the Vault of Glass.They can be identified by their silver-white frames and angular headgear. According to Ghost analysis, the Precursors had their casings built long before the age of humanity. The assumption is these Vex are the ancestors of those we face today, but due to the flexible nature of the Vex timeline the truth may not be so simple. Following the death of Dominus Ghaul, they began to gather on Mercury at the Infinite Forest alongside the Descendants, in order to unite under Panoptes, Infinite Mind. These Vex units are largely encountered in the Simulant Past which shows the Vex arriving on Mercury and beginning their conversion of the planet. In Destiny, regular Precursors appear as Majors.